One of the oldest breeds, images of the Basenji's ancestors have been depicted in the tombs of the Pharaohs. The breed developed in the Congo to help hunt small game, protect villages and work as a guide. The Basenji is an ancient breed of mystery and fascination. These dogs are among the oldest domesticated dogs in the world, and are better known for their yodelling sound. The Basenji is a dog of elegance, intelligence, and endless curiosity. It is an extremely spirited breed, and as with other breeds in the Hound group, likes to be kept active; these dogs thrive on physical and mental stimulation - and therefore will need around 60 – 90 minutes of exercise every day. 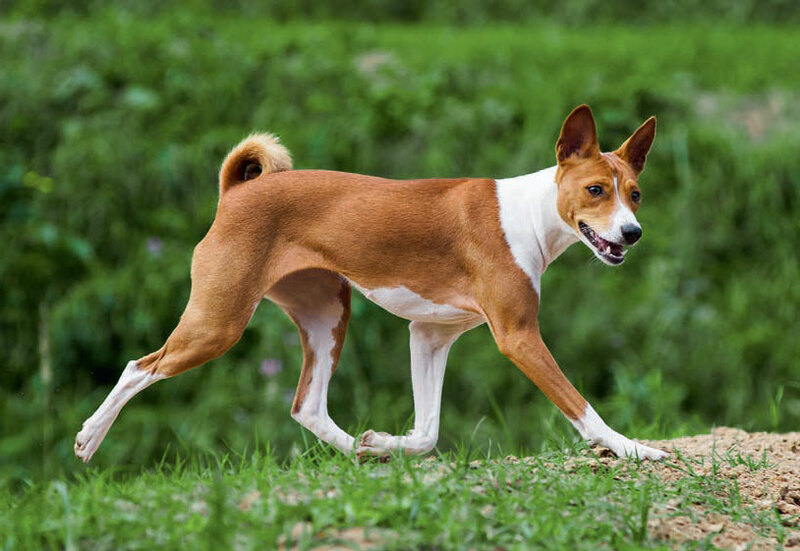 The Basenji is best suited to a small home, as long as they have plenty of exercise. Can be prone to which affects the kidneys, retinal atrophy. It is recommended whether the parents of a litter tested for these conditions. Despite being one of the rarest breeds in the Hound group, with only 32 puppy registrations in 2016, nothing can take away how truly captivating the Basenji is; its affectionate and inquisitive personality makes it a breed deserving of more recognition. With the right owner, handling, and training, Basenjis can make great family dogs, but it’s important that potential owners do their research first to get a better understanding of the breed. “They are very intelligent but they do have minds of their own and can become bored easily, so when it comes to training, you have to persevere and make it exciting for them by using a variety of different rewards each time,” says Dee. Originally used to hunt down fast-moving animals, Basenjis are used to a lot of high-energy activities, so they have a desire to be constantly on the move, and enjoy plenty of mental stimulation. Dee adds: “They are a very energetic hound; they’ll go all day! Basenjis love to run and are very fast across the ground, which means they do quite well in agility, and their intelligence makes them suited to obedience too. The Basenji can be traced back as far as the Stone Age, but has also been seen in Egyptian tomb paintings from 4,000 BC, depicting small dogs sitting under the chairs of their masters. It was believed the Basenji first came to Egypt as gifts to the pharaohs. The breed was first recognised in the modern world in the 17th century in Congo, and served as a hunting dog. Being a barkless breed, bells were attached to the dogs’ necks to flush out game. After many attempts, the breed was finally established in 1937 by Mrs Burns of Blean Basenjis, and gained Kennel Club recognition. A year after the Basenji was exhibited at Crufts, police had to control the crowds desperate to get a glimpse of the mysterious breed! More recently, the Basenji won Best in Show at Crufts in 2001. Trick training can be an excellent activity for Basenjis, as it gives them something to think about. Clicker training can be a good base to start teaching your dog some more advanced tricks. Talk to your local dog training group for more advice. Agility at a competitive level is where the speed of the Basenji is a real asset, as well as being a great way to burn off excess energy and have fun. Basic obedience training is advisable before you start. Lure coursing allows the breed to do what it does best: run and chase at high speeds. Lure coursing takes place in a fenced field around a 457m-long (500yd) course, with some twists and turns along the way. The dogs are organised into pairs and chase a mechanically operated lure. Each dog is then scored on speed, enthusiasm, agility, endurance, and his ability to follow the lure. This activity is a foolproof way to tire out your Basenji! Some Basenjis love nothing more than curling up on their owners’ laps, making them the perfect candidates as Pets As Therapy dogs — not to mention the breed’s compact size and clean appearance. Some training will be required before your Basenji can be passed as a therapy dog. Obedience and lead-training early on are advisable. Working trials combine agility with scent and obedience exercises. As members of the Hound group, Basenjis will particularly excel during the scent exercises, but this activity is also extremely physically demanding — useful for this athletic breed! The breed was first known in the modern world as the Congo Terrier. The Metropolitan Museum of Art, in New York, has a bronze Babylonian statue of a man and a Basenji.